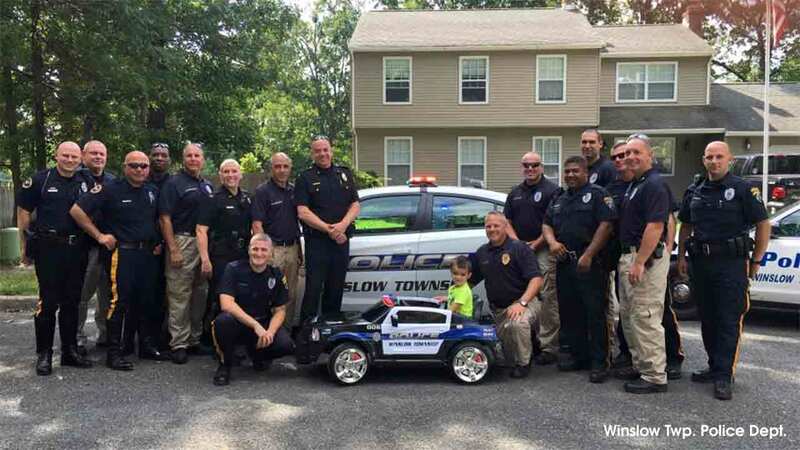 WINSLOW TWP., N.J. -- A little boy in New Jersey who bought lunch for police officers in his town now has his very own police car, courtesy of the men and women in blue. Five-year-old William Evertz Jr. is a huge fan of police officers, so last week he delivered lunch to the officers at the Winslow Township Police Department. He saved up his allowance and helped treat the officers to Subway sandwiches, saying he wanted the officers to eat healthy. "William's actions are remarkable for anyone, let alone a 5-year-old," the Winslow Police Department wrote on their Facebook page. "Winslow Twp PD commends William for his acts of kindness and his parents for raising such a great kid." That day, officers showed their appreciation by giving William a special police department shirt and other gifts. However, it seems they thought that wasn't enough. On Tuesday, police officers bought and delivered to William a personalized Winslow Twp. police car, complete with decals. The police department explained the gift by saying: "As a thank you for lunch and being such a great kid."